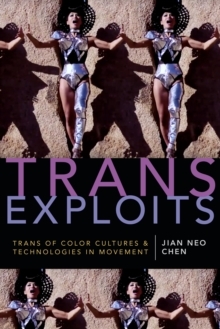 In Trans Exploits Jian Neo Chen explores the cultural practices created by trans and gender nonconforming artists and activists of color. They argue for a radical rethinking of the policies and technologies of racial gendering and assimilative social programming that have divided LGBT communities and communities of color along the lines of gender, sexuality, class, immigration status, and ability. Focusing on performance, film/video, literature, digital media, and other forms of cultural expression and activism that track the displaced emergences of trans people of color, Chen highlights the complex and varied responses by trans communities to their social dispossession. Through these responses, trans of color cultural workers such as performance artist Yozmit, writer Janet Mock, and organizer Jennicet Gutierrez challenge dominating perceptions and institutions that kill, confine, police, and discipline trans people.